This wasn’t a last ditch effort in the second half of the season nor a surprising outcome come the final whistle of Game 82. This was a playoff team through and through, something the “We Believe” team never fully grasped until the final game of the regular season and even into the first series with the Dallas Mavericks. The 2007 Warriors were very much a spurt of great luck, smarts and grittiness never seen before in such a short amount of time. The stars aligned for what was the most memorable moment in recent Warriors history. It felt rushed in a sense, considering the roster that began that season to the one that finished it in Utah. Where “We Believe” was a shot-in-the-arm for the Bay Area, a sudden realization that postseason basketball can in fact be a reality in what was otherwise basketball misery, this season’s Warriors squad feels like the start of something permanent. 2007’s team was new, vibrant, flashy and eventually a tease. Now, the heightened sense of youth, togetherness and harmony can be seen both on and off the court. Warriors fans have seen this team grow to what it is today. Whether through drafting, trades or hirings, this team was constructed with the long-term in mind. Fans are reaping the benefits now, possibly earlier than expected. This is a young team — the sixth youngest in the NBA — which presents every Warriors fan with a growing sense of satisfaction, a “this is our team and we’re here to stay” mentality. Much has changed since 2007, and you’ll be hard pressed to find many similarities between this franchise from then and now. There is, however, one constant. This constant wasn’t known before the 2007 season began, but was beautifully seen (and heard from) again Friday night: Oracle Arena. The Pepsi Center in Denver was a much discussed topic before the series began: altitude, crowd noise and the Nuggets increased effort at home all poised great threats to any potential Warriors win. It’s been a week since Game 1 and those threats couldn’t be any less important at this very moment. Oracle Arena is its own animal, a beast that can’t be tamed and the leader of the NBA pack. The crowd Friday night rivaled 2007 and every memorable moment Oracle has ever seen. Game 3’s crowd was incredible and once again pushes every other crowd to be better, to be more like Golden State. The Warriors proved once again why they have one of the best home advantages in the NBA. The Warriors wanted to be more like their Game 2 selves Friday night, and why wouldn’t they? Not that they played a particularly bad Game 1, but a near 65% shooting night that included 131 points of offense was historically great and something this team now knows it could do. 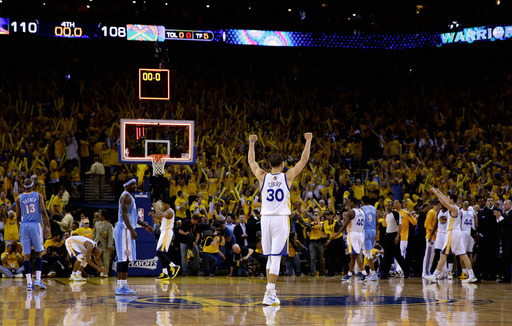 The anticipation for Game 3 rivaled anything seen at Oracle this season, and the game delivered in every it could. In what is one of the worst first rounds in NBA history, this Nuggets-Warriors series has captivated the eyes of any and all basketball fans with a pulse. There isn’t a more entertaining (or more competitive) series in the first round, which only enhances the buzz that comes with each of these games. Two systems prone for high scoring outputs through run-and-gun offenses can have this effect. This is what the NBA playoffs should be. Playoff basketball is known to get chippy, and as the games have progressed so has the disdain from both teams. Jarrett Jack re-iterated this thought post-game: “When you’re playing a team multiple times you’re gonna grow to not like each other. That’s playoff basketball.” This isn’t exactly Clippers-Warriors level of hatred yet, but there is a growing sense of physicality and irritation coming from both teams as we head towards Game 4. Game 3 was corporeal in its own right. There is a newfound feud between Stephen Curry and Corey Brewer and another feud that includes anyone who comes in contact with Andrew Bogut. It’s refreshing for a Warriors team to have enemies and for the Warriors to back up talk with their play. Even without their sneaky goon active (David Lee for those who didn’t know), the Warriors have embraced playoff physicality and emotions. The Warriors 110-108 victory over the Nuggets was a true test of both physical and emotional strength. Physically, Curry and Bogut were essentially playing (and starting) hurt, toughing out what might normally be missed games in the regular season. Emotionally, the team is coming off the best shooting performance in NBA playoff history and is surrounded by new pieces (including three rookies). Every win is truly a team effort. The first half was rough for the Warriors. Denver forced Curry and Jarrett Jack into numerous traps beyond the three-point line, daring any other Warriors players to hurt them. Normally, feeding David Lee of the pick-and-roll is a dependable option as Lee can create for himself off the dribble or pass out of it if need be. The Warriors struggled with this tonight due to the Nuggets assertiveness with their P&R defense. The result was 13 first half turnovers and a 12 point deficit at halftime. The Warriors answered the Nuggets stout defense with increased ball movement and when the opportunity presented itself, penetration of the Nuggets interior before the double could come. Jack also made a noticeable effort not to dribble into corners, a brutal flaw in his otherwise dependable offensive game. Klay Thompson had an off night offensively, but his importance defensively is nothing short of critical. With Brandon Rush out, Thompson has proved to be the Warriors best perimeter defender and as a result is often matched up with the opposing team’s best perimeter scorer. With Denver essentially playing position-less in an effort to keep up with the Warriors, Thompson was matchup up with Ty Lawson a lot in the second half. Lawson was unconscious in Game 3, but cooled down slightly with a modest 5-for-13 in the second half. Many wondered how serious Curry’s left ankle was pre-game: was Jackson (and Curry) just posturing to keep Denver guessing or was Curry’s status really in question? He played, and oh how impressive he was. It wasn’t Game 2, but no one expected an identical performance. Considering the pain Curry did indeed play through, 29 points and 11 assists was an incredible feat. Most importantly, when the fourth quarter came Curry showed a willingness to control the offense. If there is one flaw in Curry’s offensive game it’s his submission to Jack running the offense, especially in crunch time. This wasn’t the case Friday night as Curry drove on multiple occasions and ran the offense with aggression in the fourth quarter. Every win in the playoffs requires multiple efforts and Game 3 was no different. Jack held his own with 23 points, seven assists (7 TO’s) and one atrocious inbounds sequence. Barnes followed up his career night with another solid performance that included 19 points, seven rebounds and multiple run-stopping buckets. Carl Landry had his best output of the playoffs so far with 19 points off the bench. Draymond Green made one three (Yes!) and once again brought solid pressure to whoever was put in front of him on the defensive end. Finally, Bogut brought his sternness and defensive awareness to the paint once again, proving to be the most important Warriors defender. This team has resiliency, as shown in every game this series and once again shown in the second half of Game 3. A young team with so much composure is rare, and credit goes to Mark Jackson, the veterans and the maturity of said young players. This series could easily be 3-0, but 2-1 isn’t a bad position either. The Warriors know the job isn’t done and the team stressed their attention to Game 4 in the post-game interviews. There are no dualities with this team, just one succinct goal: to win the way Warriors win. How about Festus with three big blocks? ?